It’s all very well talking about how you can change recycling behaviour by adjusting the bins, but what if you’ve got only paid-for media space at your disposal? Changing behaviour by broadcasting to millions should be more efficient. But as Lord Leverhulme said or did he), ‘half of all advertising works, I just which I knew which half’. You’re in luck: I know which half. Talk to any behavioural communications specialist and they’ll tell you how important norms are in driving behaviour. This is correct. Mostly they mean the descriptive norm (characterized as permissive behaviour that informs by example) and a bit of implicit norms (characterized by unapproved behaviour that curtails action). There are others, but we’ll leave them. Back in 1990 a likely bunch of researchers – Cialdini, Reno, and Kallgren – researched littering behavior by dressing a Texas carpark with litterbins, stooges, and handbills (or, flyers, if you’re in the UK). Every car had a handbill placed on the windscreen under a windscreen wiper. Many drivers would want to remove this before driving off. We want to focus on two scenarios. The first, a purposefully litter-strewn carpark with a stooge briefed to wait until an unsuspecting car owner returned and walk by in their eye-line dropping ‘their’ handbill on the floor. The second, a purposefully clean carpark with a stooge briefed to wait until an unsuspecting car owner returned and walk by in their eye-line dropping ‘their’ handbill on the floor. – Nearly 55% of people dropped trash when they saw the stooge drop trash in a littered car park. – Only 6% of people dropped trash when they saw the stooge drop trash in a clean car park. Seeing someone litter in a littered environment amplified littering as an insider’s activity – it is prevalent, it is approved. Seeing someone litter in a clean environment amplified littering as an outsider’s activity – it is not prevalent, it is not approved. This ‘double shot’ is powerful. In 2003 Cialdini, Barrett, Bator, Demaine, Sagarin, Rhoads, and Winter examined the effects of aligning descriptive and injunctive norms on recycling behavior using specially designed adverts placed on an Arizona regional public service television network. The ad was carefully crafted in two important ways. 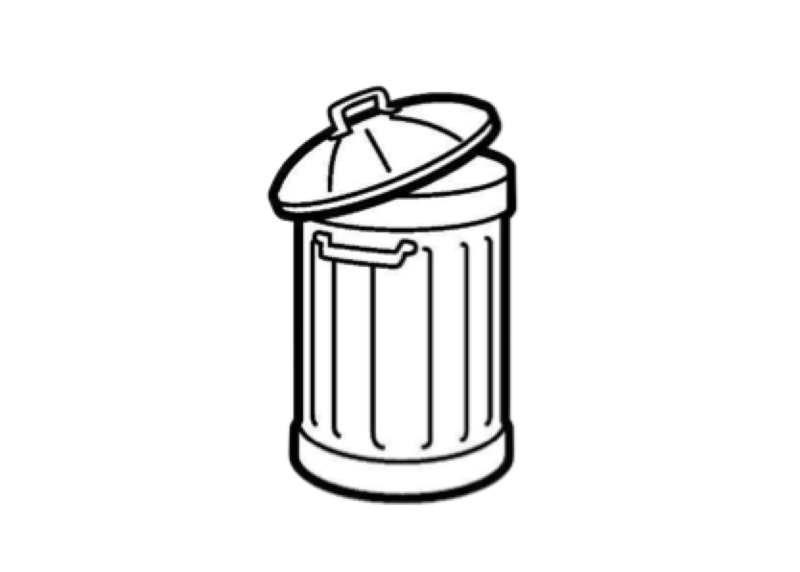 Firstly, to show a majority of people both engaging with recycling and speaking approvingly of their behaviour – in this way they exposed the descriptive condition (permissive behaviour that informs by example). Secondly, to show the actors speak disapprovingly of a single individual in the scene who failed to recycle – in this way they exposed the injunctive condition (unapproved behaviour that curtails action), and aligned it with the descriptive. – These ads increased recycling in the areas exposed by over 25% compared with similar areas where the ad never played: Another massive swing in behaviour. The ‘Don’t Mess with Texas’ 1980s American littering campaign has been written up extensively (Chip and Dan Heath’s book Made to Stick is a good’un). In summary, the 1980s Texan youth continued littering on highways despite fines in the thousands of dollars. Their distain for the law was matched only by their love of Texas’ sporting and country-music heroes; these were the people the youth aspired to be. 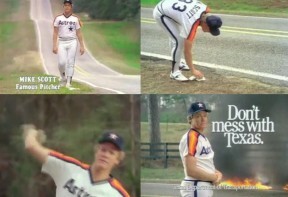 A TV campaign was created using home-grown stars such as Mike Scott (pictured), Lance Armstrong, Chuck Norris, Willie Nelson, Lyle Lovett, Owen Wilson, and many more who all spoke directly to camera imploring the viewer to stop ‘messing with Texas’ (injunctive – this is not approved) as they were shown throwing litter in a bin (descriptive – this is prevalent). – Within five years roadside litter was down by over 70%. The normative representation avoided the negatives of guilt/shame and instead gave positives of pride and group identity. While the Arizona recycling ad test does not separate pre-existing attitudes, humour, and other factors that may have influenced recycling, they found an intriguing difference. The injunctive affected people’s conscious assessments of the ads’ persuasiveness. The descriptive ‘influenced intentions directly’. Why? An overt appeal to behavior – a speaking actor – is routed though our cognitive capacity. It is a rule-governed, calculating, reasoned effort that has to negotiate a cognitive assault course. Viewing the raw behaviour of others – seeing people recycle – plugs that behavior straight into our brain: we get the answer is if for ‘free’. It is an intuitive, rapid, and associative effort. Just as fish school, and insects swarm, the intuitive, rapid, and associative effort rules. How do we codify all of this research knowledge? Were the average behaviour of a group is different to the perceived behaviour of the average person, highlighting one or the other can create or destroy behaviour. This is the quasi-stationary foundation of normative behaviour, and where mass communication can do it’s work. It’s why the TV ads popularise one, and marginalise the other. With this so effective, those that write the scripts truly have the power to change behaviour; Quis custodiet ipsos custodies? Бездепозитные бонусы казино: получай бонус только…	На нашем сайте Вы найдёте лучшие бездепозитные бонусы за регистрацию в онлайн казино и бесплатные фриспины для новичков. Включая, бездепозитные бонусы с выводом прибыли от таких популярных интернет казино как Вулкан, NetGame, Riobet, Play Fortuna , Azino777, Адмирал и многих других.